A 2005 study on American men and women who meditated a mere 40 minutes a day showed that they had thicker cortical walls than non-meditators. What this meant is that their brains were aging at a slower rate. Cortical thickness is also associated with decision making, attention and memory. 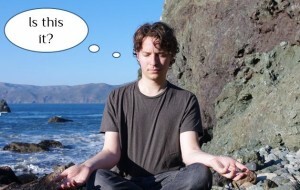 When I mention to people that I provide meditation instruction, most people seem very curious. So many people are drawn to meditation and yet not that many seek out qualified meditation instruction. Odd. Why do people want to learn how to meditate? Everyone is talking about how great it is and yet we’re concerned that very few people are using meditation to find the peace and balance they seek. The research surrounding the benefits of meditation is quite abundant. More calm, more peace, more self awareness, less reactivity, more creative control over one’s life, better achievement and for those who want it, a sense of spiritual purpose. But perhaps meditation instruction in Charleston is problematic. It seems many Charleston Meditation Centers are linked to a particular religion like Buddhist meditation or Kriya meditation. Does this mean we need to become a Buddhist or a real Yogi in order to practice these sorts of meditation? Isn’t there non-religious meditation instruction in Charleston? Our feeling is… no, you don’t have to make meditation be part of a particular religion. But you do need a technique that you can practice that makes sense to you so you can learn it. Meditation is not just about breathing and having no thoughts. Instead, we say that breathing is important, of course but just focusing on your breathing for 30 minutes is boring and NOT transformative. Trying to still the mind is also very frustrating. Meditation leads to growth and transformation if it has purpose. This means you go into a meditative state with something to meditate on. This will open up a world of wonder for you. Our Charleston Meditation Classes are offered in the West Ashley neighborhood on St Andrews Blvd. This seems to be an area of Charleston where a lot of Charleston folks want to learn to meditate and want a practical approach. We offer a Level 1 Meditation Course that has proven to be very popular. Why? Because this meditation instruction addresses the very challenges that almost all people face who diligently try to learn meditation and can’t get to a consistent practice. We feel it is because they are striving to do things that are not that important. Trying to still the mind isn’t easy nor essential. Dropping out of the realm of mind is. We can show you the difference.